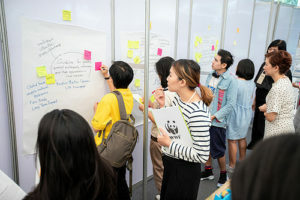 As part of the Sustainable Brands Bangkok 2018 forum, WWF partnered with UN Environment, TOPS Supermarket, Family Mart, the Sustainable Food Lab, Sookjai Farmers’ Market and Bangnampueng Market to organise a workshop highlighting the challenges and opportunities of farmers’ markets upholding principles of sustainability while directly connecting to local communities. 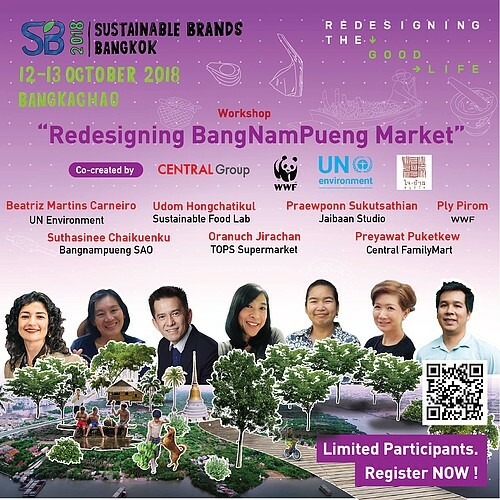 The workshop titled “Redesigning Bangnampueng Market – Promoting farmers’s markets as a bustling hub of sustainability” aimed at promoting knowledge exchange and dialogue on sustainable consumption and production (SCP) in food systems among local communities to better connect consumers and producers. 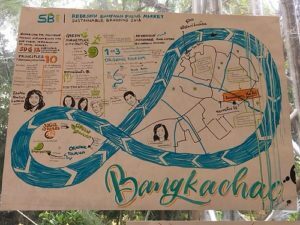 By working directly with case studies and the local farmers’ market model, including Bangnampueng Market, the main factors constituing sustainable food systems were not only discussed, but at the same time practically demonstrated. The workshop stressed the need to promote locally produced food and products in farmers’ markets as a form of sustenance for the livelihood and well-being of local communities. Widespread environmental degradation, land use change and deforesatation are posing threats to food production, health, ecosystems and climate change. Sustainable consumption and production (SCP) can serve as a key factor in establishing sustainable and resilient food sytems, and the maintenance and sustenance of local farmers’ markets can contribute substantially to the local communities’ economy and well being.